Large cents have earned a spot in history as the first coins ever minted by the United States government on its own equipment and premises. 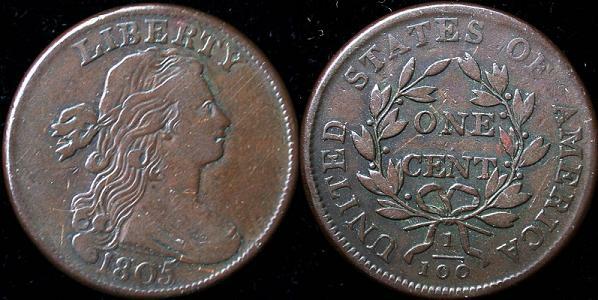 They were minted from 1793 to 1857 at the mint in Philadelphia, the only U.S. Mint at the time. In 1815, however, a fire at the mint prevented the coin from being produced that year. People of that time period didn't like to carry the coins because they were so large and cumbersome. And they were also fairly heavy. The weight of a dollar's worth of these coins is about three pounds. These large coins have become an interesting part of history however, because they show us the value of money during this era. 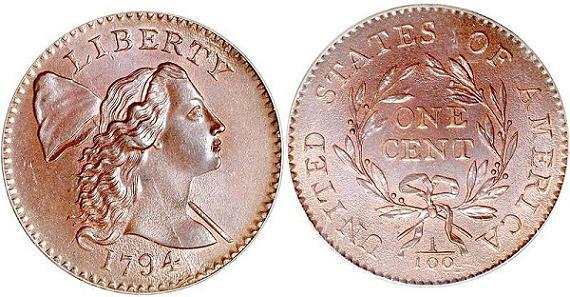 At the time they were in circulation, the coin was not called the "Large Cent". It was just the one cent coin of the day. 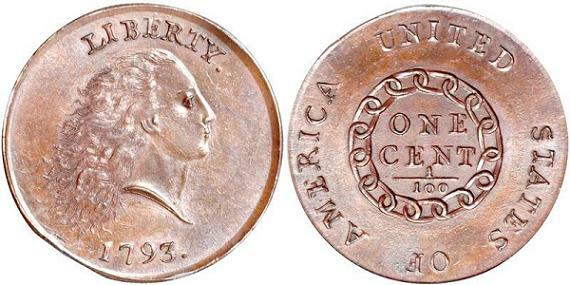 Today it is called a large cent by coin collectors because compared to our modern day "penny", it is huge. This coin is larger that the modern quarter (about 27mm). All Large Cents were minted at the Philadelphia Mint and have no mint mark. Were Produced in Several Varieties. Henry Voight was the designer of this coin. He intended for the chain on the back to represent strength, but people didn't like the design at all. They viewed the chain as a symbol of slavery. However, since only 36,103 were minted and many of these have not survived the years, it has become a real prize to the few collectors lucky enough to have one. If you also consider that it was the first regular federally issued coin with a design and type that was only made for one year, you can see why it is highly prized by collectors. All surviving specimens bring high prices. Because of the strong reaction to the chain on the coin, it was removed later in 1793 and replaced with a wreath. The bust of Liberty was also redesigned with longer and wilder hair. There were about 63,000 coins made with the wreath on the reverse. This design "tamed" the wild hair of Liberty and faced her to the right. A cap, an ancient symbol of freedom, was added and the wreath on the reverse was revised to a laurel wreath. On this design, Liberty is wearing flowing hair tied with a ribbon and has a drapery at the neckline. The reverse design features an olive wreath. This design of the coin gets its name from the fillet (narrow headband) Liberty is wearing. It seems odd that this particular headgear was chosen for Liberty as it is a type of headgear only worn by male athletes in ancient Greece, given to them as prizes for winning local sporting events. 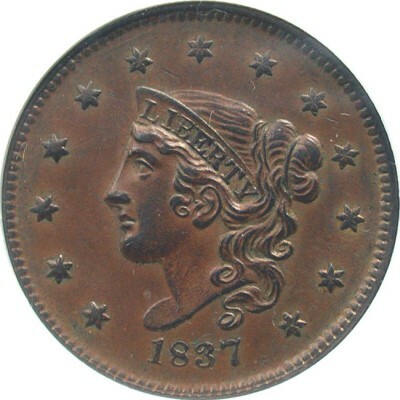 The copper used in the Classic Head cents contained less metallic impurity than previous copper used and as a result the coins were softer. This allowed them wear and corrode more easily than other issues so it is really difficult to find these coins in good condition. Matron Head (18161839)- Due to much criticism of the Classic Head from the public, the coin was redesigned in 1816. The portrait was enlarged and Liberty was given a much more mature look. This led to it being referred to as the Matron Head. Liberty was also surrounded with stars along the outer edge of the coin. Braided Hair or Petite Head (18391857)- Once again, public critisism prompted one last major change to the coin. It was updated by giving Liberty a slimmer, more youthful appearance. 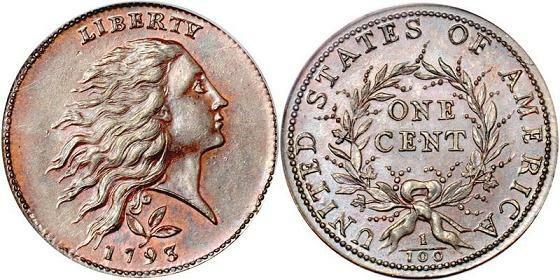 A mint employee coined several large cents dated 1868 about 11 years after the large cent was discontinued. I am sure he knew they would be instant rarities to collectors. And I suppose he was right as less than a dozen of these unofficial issues are known to survive. Numismedia Fair Market Value Price guide. Also see Coin Values Discovery for grading images and value charts for your large cent. These coins were struck in both bronze and copper-nickel. 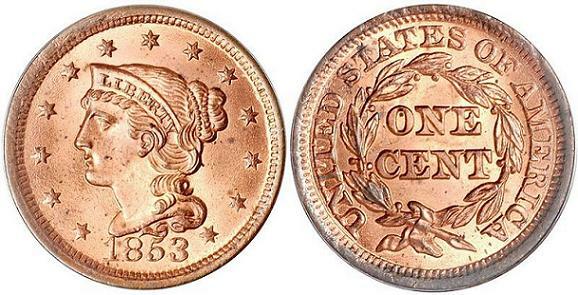 In 1857 the Large Cent was officially replaced by the modern-size one-cent coin we know today as the "penny". One reason, other than the bulk and heaviness of the coin, is that the copper content became more valuable than the coin's face value.